Boston has won 16 games in a row and has the best record in the NBA. How have they done it? And can they possibly keep it up? It was hard to know what to expect from the Celtics coming into this season. They added Gordon Hayward and Kyrie Irving, two offensive stars, but they lost their offensive focal point, Isaiah Thomas, and had to mine their depth in order to pull off those acquisitions. The Vegas win totals and statistical projections mostly agreed: this was about a 55 win team, right in line with last year’s version. But when Gordon Hayward went down on opening night, it seemed their hopes of repeating as the #1 seed in the Eastern Conference were dashed. The lack of depth became even more glaring — the Celtics were going to have to rely on a slew of rookies or second year players, not generally a recipe for contention. And yet here we are, a little over a month into the season, with the Celtics in the midst of a 16-game win streak, in possession of the best record in the NBA at 16-2. They have the league’s 3rd best point differential, one which normally corresponds to that of a 63 win team. And that’s despite the Hayward injury, despite Marcus Morris missing half of the season, despite Kyrie Irving missing two games, despite 75% of their minutes going to players 25 years of age or younger. How have they done it? The answer turns out to be surprisingly simple: defense. The Celtics’ defense has been historically good thus far. They have allowed the fewest points per possession in the league by a large margin: in fact, the difference between Boston’s #1 ranked defense and the #5 ranked Warriors’ defense is larger than the difference between the Warriors’ defense and the #25 ranked Bucks’ defense! This is after ranking 15th on the defensive end last season, trading away two players with stellar defensive reputations, Avery Bradley and Jae Crowder, and trotting out a motley crew of young players. What at first seemed like a simple answer, then, turns out to be a bit more complicated. What is going on? And can they possibly keep this up? It’s tempting to say that a large part of this is luck. The Celtics rank 2nd in 3PT% defense, with opponents making just 32.5% of their attempts, and they rank 3rd in long midrange FG% defense. As we saw in “Is the Magic Real?”, long jump shooting is the flukiest of early season stats. 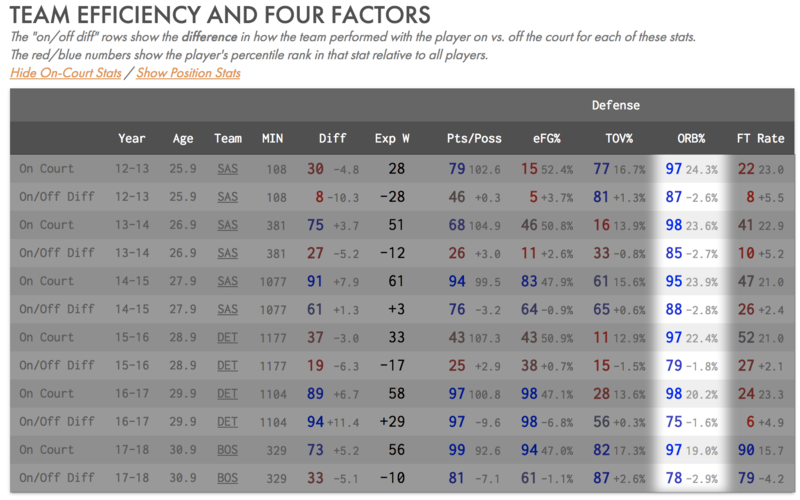 But the Celtics’ defensive success has been about more than their shot defense. First, as Kevin Pelton detailed, according to Second Spectrum coordinate data, when you take into account shot location and defender distance, the Celtics’ opponents have only shot slightly worse than expected. A lot of the poor jump shooting is not just opponents missing shots they should make — it’s good defense. We can do some back-of-the-envelope math that punches even more holes in the idea that their success has been solely due to some fortuitous bounces. If the Celtics had allowed a FG% on midrange shots and threes equivalent to the rate of the 5th ranked defense from each location last season, it would make a real difference: their defense would be 3.6 points per 100 possessions worse. That would drop them from their league-leading defense all the way down to…the third ranked defense, and a point differential that’s the equivalent of a 54 win team. In other words: their defense has been so good that even if it comes back to Earth as expected, it will still remain one of the best defenses in the league, and can still be the engine of a very good team. Have they gotten lucky? It seems that way. But that also doesn’t come close to explaining their defensive success. So if it’s not the jump shooting, what is it? Let’s start with the easy points defense. Boston has been the best in the league in both preventing putback points and points in transition. Putbacks and transition make up a relatively small portion of the game, but because they are the most efficient ways to score they can make a big difference to the bottom line results. 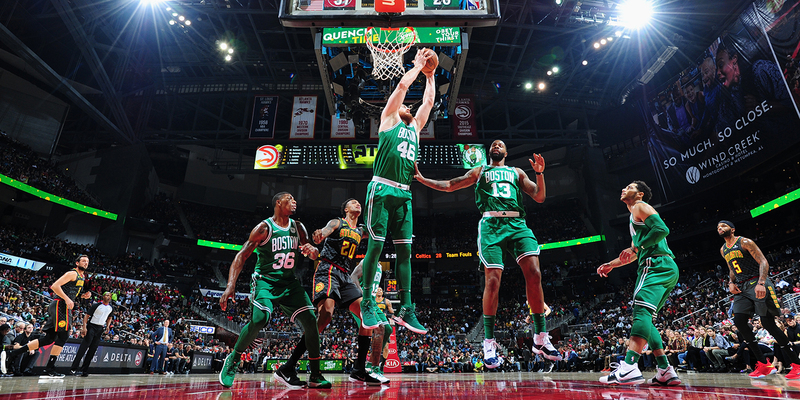 In the halfcourt the Celtics rank 17th in preventing shots at the rim, and 13th in FG% defense at the rim. But because of the easy points defense those numbers jump up to 13th and 8th overall, respectively. 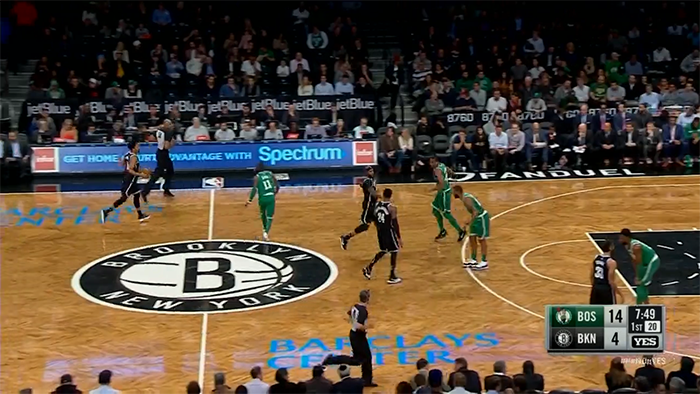 That transition defense seems somewhat sustainable. Their defense against transition from rebounds has largely been about forcing misses rather than preventing opponents from running, which should give us some pause: opponents have shot very poorly from almost all locations in transition against the Celtics, at rates which will not continue as the sample increases. But their transition defense against turnovers has been good, and has been helped by their offense: Boston has turned the ball over at the 4th lowest rate in the league thus far, so opponents have not been able to get high efficiency opportunities off of their miscues. That jump in rebounding is astonishing, and its cause is the same as the cause of the Celtics’ overall defensive improvement: they aren’t doing much different from what they did last season, but they’re doing it with players who fit what they do much better. It’s a story of great coaching meshing with the right personnel. Direct the ball: keep the ball on the side or to the weak hand. Weak side loads to the ball. 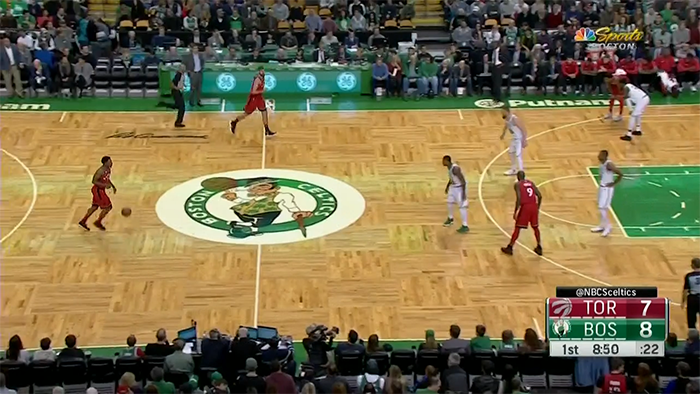 Get to shift positions early: shrink the floor to prevent dribble penetration. Start in, build out. Switch liberally with anyone except traditional centers, particularly late switches. Traditional centers drop back in pick-and-roll defense. Boston follows pick-and-roll principles that have spread across the league over the last few years: force the pick-and-roll ball handler to one direction. 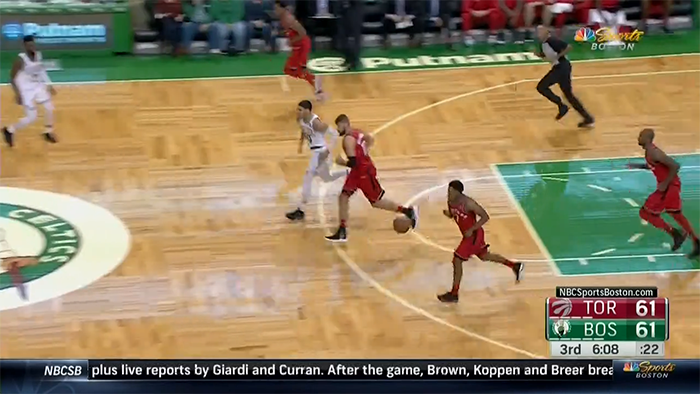 On the side of the floor, that means keeping it on the side, a coverage Boston calls Ice. 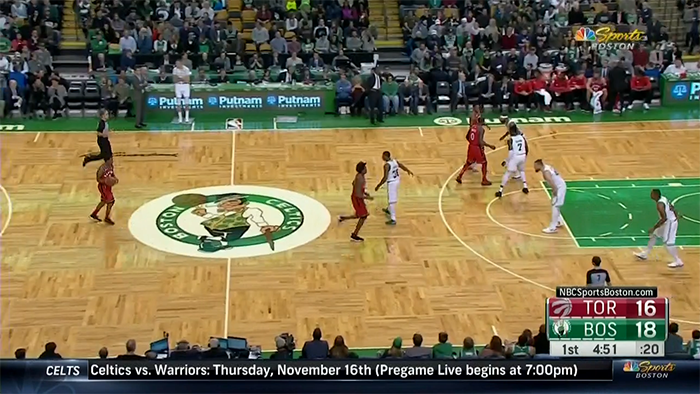 In the middle of floor, that means forcing the ball handler to his weak hand, which they call Weak. 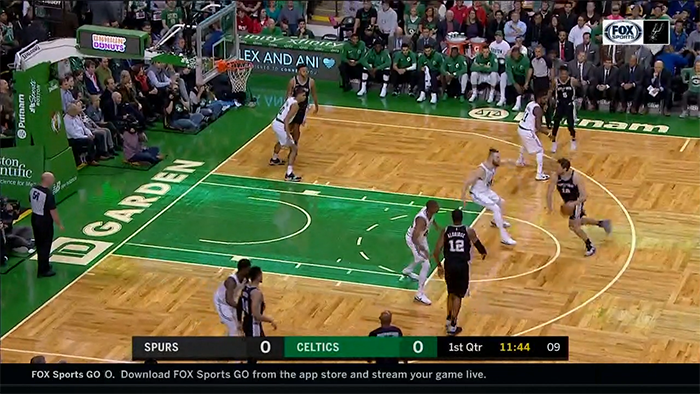 This works because it constrains a player’s options: in the middle of the floor his teammates are all one pass away, but on the side some of his teammates will be across the court. To get the ball to those teammates he’d need to throw a long pass over the top of the defense. So by keeping the ball on the side, the defense can load players to the ball, protecting the basket and only opening up a much tougher pass. But these kind of plays happen to every team. The surprising part is how rarely this happens, especially for such an inexperienced team. The skill and space in the modern NBA makes players pay a steep price for straying too far from their men. But leaving players on an island to defend one-on-one can also be a recipe for disaster. 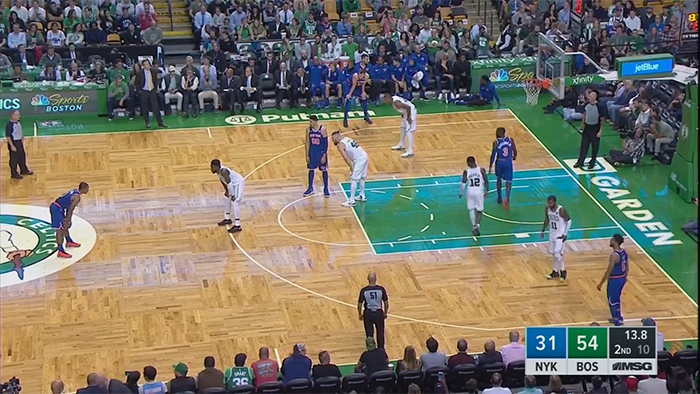 There’s a middle ground that is about intelligent shifts, which, when timed correctly, shrink the floor while still allowing the defender to get out to their man. The goal is to start in and then, as soon as the ball is picked up, recover back out to your man. 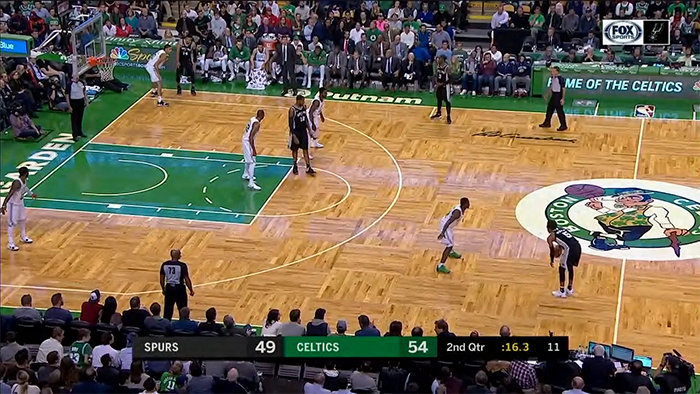 The Celtics switch often, both in traditional fashion and out of pick-and-rolls using a tactic called a “late switch”: instead of simply switching at the moment of the screen, the ball handler defender is in pursuit for a few dribbles, and then peels back and switches onto the screener as the action is going on. That second clip is quite impressive — the late switch is very subtle, and represents an intuitive understanding of the concepts by Smart and Baynes. 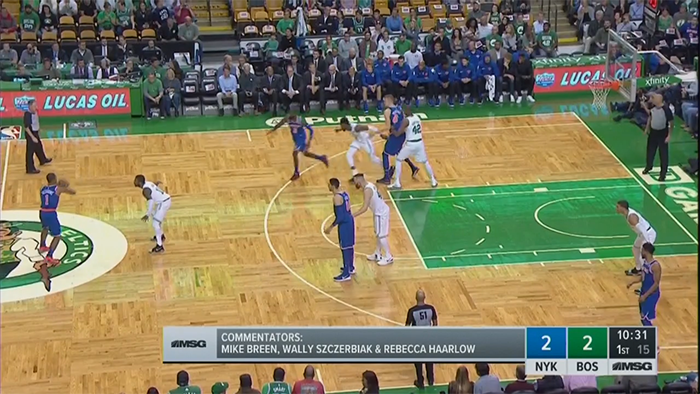 They deftly navigate the pick-and-roll exchange, never leaving any option open but not ending up switched at the end of the play either. This is a dangerous tactic if a team doesn’t have players who are intelligent and communicate well: you can easily end up with embarrassing Keystone cops plays. 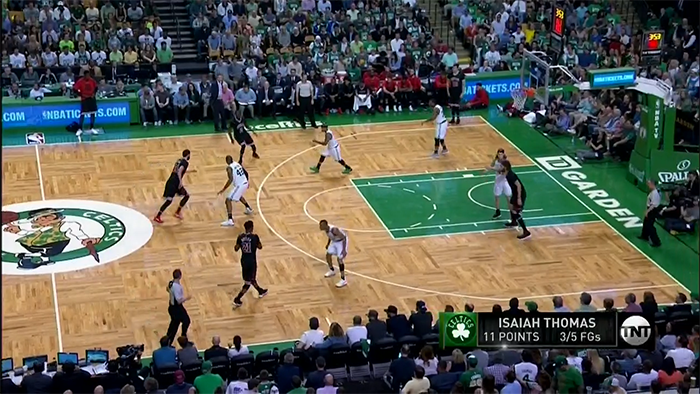 But as that clip illustrates, the Celtics have executed these switches remarkably well. All of these principles make sense in theory, but still need the proper personnel to execute them. Without the right players you can’t shrink the floor as effectively. With the wrong personnel, switches can easily be bungled, they can create mismatches and they can cause major headaches on the defensive glass. As we saw earlier, this last point is key. This scheme should lead to good defensive rebounding: help is minimized so players are near their men; the weakside defenders are in the paint, in position to rebound; late switches mean there’s always a body on the roller; opposing teams take a lot of jumpers, which produce many fewer offensive rebounds. But that’s only the case when the right players are executing that scheme. There was much hand-wringing over the loss of Avery Bradley and what it would mean for the Celtics’ defense, but overlooked was the fact that the Lilliputian backcourt of Bradley and Isaiah Thomas was a major liability on the defensive glass. Opponents rebounded 30% of their misses over the last two seasons when that duo shared the court, a mark which would rank the Celtics as the worst in the league. But with any other combination in the backcourt that number was league average. Jae Crowder, too, was viewed as a big part of Boston’s defense, but he also seemed to be a solid negative on the defensive boards, particularly when playing PF: the Celtics were a much better rebounding team with him off the court vs. on in each of his three seasons with them. There’s an important, larger point to draw from this. The biggest mistake people make in defensive evaluations, both inside and outside of teams, is to vastly overrate the impact of on-ball defense. On-ball defense matters, but it’s difficult to analyze and it’s far from the only important aspect to defense. Defense is very much a team endeavor, and what a player does off the ball matters more than what they do on the ball — if for no other reason than there are many more plays where they are off the ball. However good Bradley and Crowder were guarding the ball, and whatever positives they brought in other ways (and there seemed to be many, particularly on offense), defensive rebounding was an area they dragged the team down, and this took a significant bite out of their defensive value. Aron Baynes’ defensive on/off numbers. See the full table on Cleaning the Glass Stats. As the table shows, his teams have always been elite on the defensive boards when he’s been on the court, and their defensive rebounding has taken a significant dip when he’s sat. That is a very impressive play by Brown, playing shooting guard. There aren’t many other SGs in the league who could make that same play and single-handedly prevent the putback. The defensive rebounding is a key difference between this season and last, and it’s representative of what’s worked across the board: a perfect marriage of personnel and scheme. It’s phenomenal coaching, getting players to be in the right spots so frequently, and be able to communicate on the fly like this. Especially players so inexperienced and without continuity in the system. But it’s also a credit to the players. Tatum’s positioning is far better than most rookies, and bodes very well for his future on that end of the court. Marcus Smart calls out switches like few others, yelling and pointing directions like the world’s most violent orchestra conductor. 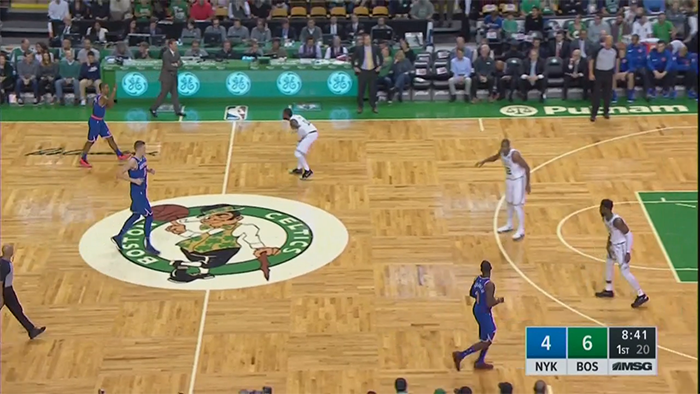 Horford’s defense has been flat out sensational. Opponents won’t miss jump shots like this the rest of the season. The defensive rebounding and foul rate likely won’t stay at quite these low levels. This defense is very good, but it’s not historically good. Because of that, the Celtics will need to figure out how to get a little more on the other end of the court to be thought of as a real championship contender. But if they do? Watch out.